Investors have committed more than $35 billion to the Vanguard REIT ETF (VNQ) making it the 19th largest ETF in the marketplace. Despite its size and success, the fund is about to make some changes and dividend investors might not like it. The REIT ETF has a good long-term track record, but 2017 has been a different story. Its 5.1% year-to-date return is well behind the 10% return of the S&P 500 Real Estate Index. The main reason for this year’s underperformance is a relatively narrow real estate index that’s missing out on some of the sector’s biggest winners this year. Its current benchmark, the MSCI US REIT Index, notably excludes both mortgage REITs and selected specialty REITs, such as real estate services and real estate development companies. That’s where some of 2017’s top performers, such as American Tower (AMT) and Crown Castle (CCI), reside. As a result, Vanguard has put a proposal in front of shareholders that would change the fund’s tracking index to something more inclusive. The REIT ETF’s index is expected to change to the MSCI US Investable Market Real Estate 25/50 Index sometime in early 2018. The new index would add the previously mentioned REITs to the mix as well as a handful of other specialty products. While it may not seem like a big deal in the grand scheme of things, it actually does have implications on both risk and income. 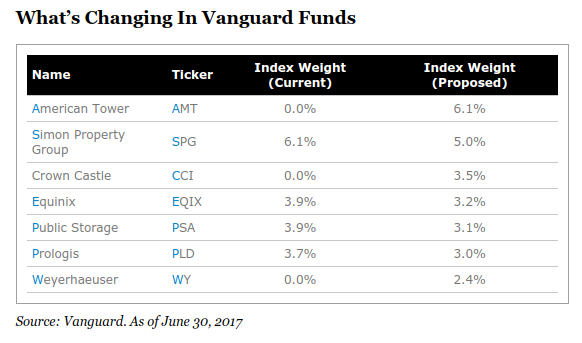 First, let’s take a look at how the fund’s top holdings are expected to change. Three of the top seven holdings, and about 12% of fund assets just from those three holdings alone, will be new to the fund. Year-to-date, American Tower is up 39%, Crown Castle is up 25% and Weyerhaeuser (WY) is up 12%. Is there a bit of performance-chasing that is motivating Vanguard to make this move? Perhaps. I’m not sure that Vanguard makes this change if the currently absent REITs and other securities are underperforming this year, but the move to target a more expansive diversified universe of real estate securities should be one that serves it well over the long-term. Historically, the ETF’s new index has been modestly less risky. The new index carries about two dozen more components than the original, but its median market cap skews smaller than the original. Risk statistics aside, income seekers may be turned off by what’s likely to be a drop in the dividend yield. Many REIT investors are attracted by the sector’s high dividend yields. The Vanguard REIT ETF’s trailing 12-month yield stands at around 4.3%, putting it in the upper half of the REIT ETF universe. The new index states its yield as of August 31st is 3.69%. That’s a significant drop for a fund in a segment of the market that often directs new money towards higher yields. 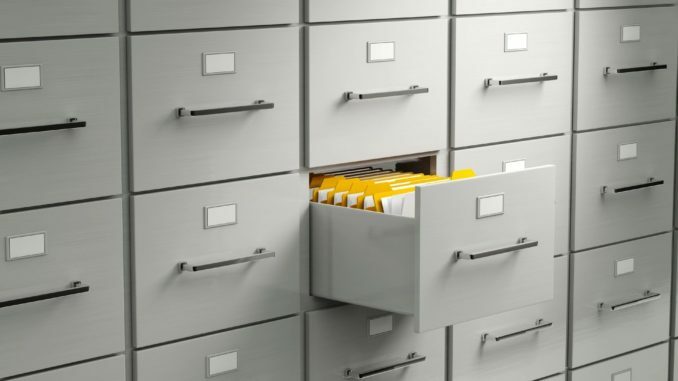 The new yield would put the fund about on pace with the Real Estate Select Sector SPDR ETF (XLRE) and the Fidelity MSCI Real Estate Index ETF (FREL). Is the reduction in yield enough to make investors consider moving their money elsewhere? An index change such as this is notable for a fund this large. Investors should be aware of what’s under the hood of their fund and note that past statistical data (returns, risk levels, etc.) are basically being reset once the new index is in place. The Vanguard REIT ETF will likely remain a solid fund (and the low expense ratio always helps), but maintain a watchful eye.